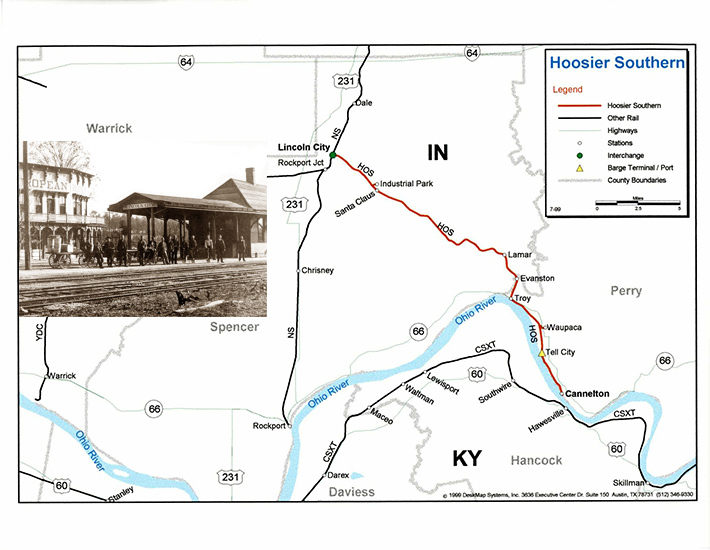 The Hoosier Southern Railroad (HOS) is a 22 mile short line that operates between the City of Cannelton in Perry County, Indiana, and Lincoln City in Spencer County, Indiana. The track that makes up the Hoosier Southern Railroad was laid in 1886-87 by the Louisville, Evansville & St. Louis Railroad. The first train ran to Tell City on December 31, 1887. It was a mixed freight consisting of two flat cars and a caboose. The L, E & St.Lo ran passenger and freight trains on the line until 1899 when the Southern Railway purchased the line. Over the years the Southern Railroad’s “Cannelton Branch” would see mixed freight/passenger trains hauling passengers and freight for the booming furniture industry until 1939 when competition from increased automobile traffic necessitated the end of passenger service. Freight service would continue on the line with 1 train running a round trip out of Lincoln City to Cannelton six days a week. As time went on and freight tonnage was reduced the days of service declined to an “as needed” basis in March of 1971. In 1988 The Southern, now known as the Norfolk Southern Railway, leased the line to the Indiana HiRail Corporation, who serviced the few remaining industries until 1991when service was suspended on the line and Norfolk Southern announced its intention to abandon the line. When the Norfolk Southern Railway decided to terminate service on the Cannelton Branch the Perry County Board of Commissioners decided in 1991 to form the Perry County Port Authority, who then moved to purchase Norfolk Southern’ s (NS) 19.8 mile rail line from Santa Claus to Cannelton, Indiana. 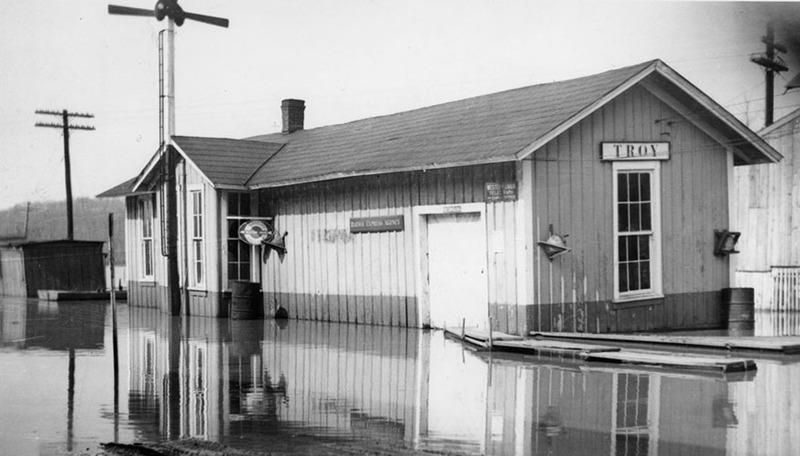 The county leaders knew that for the area to attract major industries, rail transportation had to be preserved. In 1996 the Port Authority acquired an additional 2.4 miles of railroad from the NS from Santa Claus to Lincoln City, Indiana. The 22 miles of rail line operate in Perry and Spencer counties and interchanges rail traffic with the NS at Lincoln City. The Port Authority is governed by a Board of Directors who are appointed to the position by the Perry County Commissioners to four-year terms. The Port Authority asked the community to help name the railroad and decided on the Hoosier Southern Railroad, a name suggested by Tell City resident Pam Drake. The first revenue car moved on the Hoosier Southern in 1995. The vision of the Perry County leaders soon paid dividends to the area with the announcement by Waupaca Foundry in 1995 that they would build a new facility in the Perry County Industrial Park, located near Tell City. Rail transportation was vital to their decision to build at this site. The Tell City River Port was established in 1996, when the PCPA leased the property from the City of Tell City. In 1901 the property became home to a substantial factory built & owned by the US Hame Company, which manufactured a variety of products, including pack saddles for the US Military. 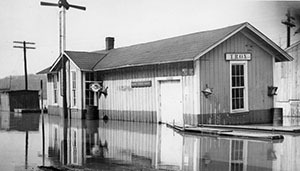 Later the property became part of Tell City Chair, and finally to Maxon Marine, a shipbuilder that began operations in 1944, building barges for the US Navy. Shortly after World War 2 they began building tow boats and barges for private industry and the Coast Guard. The last barge at the shipyard was completed in 1993 and the shipyard soon closed. The property ended up in the hands of the City of Tell City in 1995. 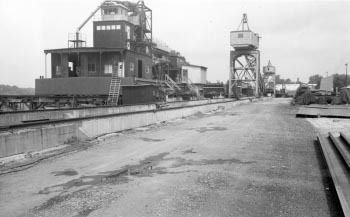 With the City of Tell City working closely with the Port Authority, the parties were able to establish a port operation at Tell City on the old Maxon Marine site. Today the Tell city River Port is proud to have the Tell City Boat Works on site, continuing to build barges and tow boats, just as Maxon Marine did for fifty years. © 2013 Hoosier Southern Rail Road. All Rights Reserved.